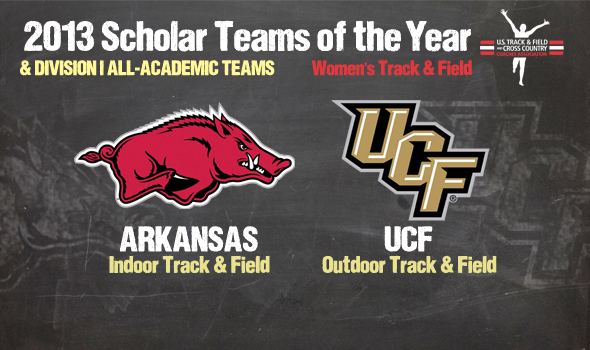 NEW ORLEANS – The Arkansas and UCF women’s track & field teams have earned Scholar Team of the Year honors for the 2013 Division I indoor and outdoor track & field seasons, respectively, the U.S. Track & Field and Cross Country Coaches Association (USTFCCCA) announced Wednesday. Among 187 women’s programs that demonstrated excellence both academically and athletically to earn All-Academic Team honors, Arkansas and UCF stood out as the top-finishing teams at the indoor and outdoor NCAA Division I Championships, respectively, to post at least a 3.00 cumulative team grade point average. The full list of All-Academic Teams can be found below. For the second consecutive indoor season, the Arkansas women have claimed indoor track & field Scholar Team of the Year honors with a 3.278 cumulative team GPA. The Razorbacks finished fourth at the NCAA Division I Indoor Track & Field Championships with 42.5 team points — just 1.5 shy of a tie for runners-up — behind two second-place event finishes in the 400 meters and 4×400 relay and eight overall scoring performances. The Razorbacks’ two-in-a-row is the first time that feat has been accomplished indoors since the Tennessee women earned the award in both 2009 and 2010. UCF claimed the outdoor track & field Scholar Team of the Year award with a cumulative 3.166 team GPA, marking the fifth different team to earn the honor in the past five seasons. This is the first such award in UCF’s program history. The Knights were fifth overall at the NCAA Division I Outdoor Track & Field Championships with 35 team points. A pair of runner-up finishes at 100 meters and in the 4×100 relay accented six total scoring performances for UCF. The USTFCCCA also announced Tuesday the 2013 Division I All-Academic Track & Field teams. A total of 187 institutions earned the distinction as a result of earning a cumulative team GPA of 3.00 or higher. Wofford was the top team in Division I with a cumulative team mark of 3.61. North Dakota finished runner-up at 3.599, followed closely by in-state rival North Dakota State and Oregon State at 3.58. The Atlantic 10 was the best-represented conference with 12 women’s teams earning All-Academic Team accolades. The Big East was right behind with 11 teams on the list.